The Rockport Film Review: Angela Bettis Tribute: "Toolbox Murders"
Angela Bettis Tribute: "Toolbox Murders"
In 1974 Tobe Hooper directed the original horror masterpiece "The Texas Chainsaw Massacre" and created an instant name for himself. But over the past few decades, he really hasn't done anything to write home about. Except that in 2004, he directed Angela Bettis in a remake of the 1978 film "The Toolbox Murders". This new version stars Bettis as Nell as she and her husband move into the Lusman Arms apartment complex in Los Angeles. The complex is under an extensive renovation and is a complete mess, but they have a doorman. The story feels like a lost film from Roman Polanski, drawing a lot from the themes of "Rosemary's Baby" and "The Tenant". The story also throws in a bit of old Hollywood noir, as the apartment building was the former residence of the infamous Black Dahlia victim Elizabeth Short. The building is a character in itself as a dark and foreboding presence. The movie was shot at the old Ambassador Hotel which has a pretty storied past in itself. The Lusman Arms is the place where young actors come with dreams of making it big. Although Nell is a school teacher and her husband Steve and med student. 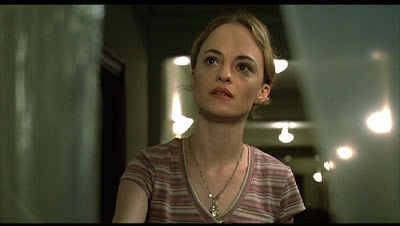 From the first scene of the movie, we know that there is a ski-masked maniac in the building who is killing off the resident and things seem to point towards Ned the quiet and creepy young maintenance man who kind of looks like Jack White. 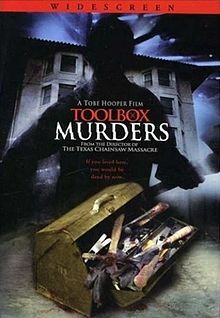 Like the original film he kills his victims with various tools in his toolbox, so yeah the title is pretty self-explanatory. Nell immediately gets the creeps about the place, but it's so affordable since they have to live in a construction zone. We get to know a lot of the residents from an old man who has lived there for 60 years, to the young couple that is always fighting, and the middle-aged couple with a teenaged son. After hearing a bunch of screaming from next door Nell calls the cops, but they find nothing. She is all alone with her mind allowed to wonder and with the paper thin walls she can't get a moment of silence. As the terror and suspense increases Nell starts to investigate the history of the Lusman Arms. Acting on a tip from the Old Man she finds that each floor is missing a room and that something sinister lurks within the walls. This is a fun little movie that is all about Angela Bettis and her character Nell as she fights for not only her life but for her sanity. The "Toolbox Murders" DVD is available online or from Netflix and includes a couple of commentary tracks and some deleted scenes. So I guess you should put the Hot Pocket down and go watch this movie. Angels Bettis Tribute: "Sick Girl"
A Tribute to Actress Angela Bettis: "May"